Sunday in the South was a time for family when I was growing up. It was the day we went to church, sat in the pew with my grandparents, and ate Sunday dinner (which is the mid-day meal) afterwards. Sunday dinner was always a bigger affair than “lunch”. My mother or grandmother would start cooking first thing in the morning—preparing a roast or chicken, peeling and cutting potatoes, snapping beans. Usually the roast would cook while we were at church and the rest would wait until we came home. Sometimes it would be our little family, other times it would include aunts and uncles and cousins. Sometimes we would have company over. Often it was a slow day, a time with family and friends to eat, talk, work, play, and be silent together. The tradition eroded over time and as we grew up. There were more out-of-home activities and busier schedules. But I still think of Sunday as family day. A day to reconnect before starting a busy week of school and work. These days I don’t usually cook a big dinner, but we spend Sundays at church, then playing and working together in the afternoon. And, often the afternoon includes visits to or from family or friends. I am going to try to write about my grandparents (and sometimes other family) here on Sundays. A way to remember family and reconnect. There are important connections, and I want to honor them. 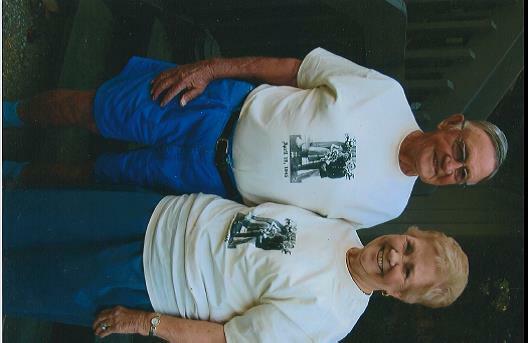 So, an introduction to my grandparents and their role in my life . . . . Since my father was not around much when I was very young, my grandparents stepped up their support of my mom and their role in my brother’s and my life. My maternal grandparents (Mom-mom and Dado), who lived in our same town, often took care of us after school. They also kept us for many weeks during the summer—often at their beach cottage in Kitty Hawk. My grandfather’s mother, Grammy, lived a few houses down from us and also took care of me a lot. I stayed with her many days when I did not have preschool. My paternal grandparents (BJ and Granddaddy) came to visit often when we were very small and then had us come stay with them for a few weeks in the summer and winter each year. They provided a place of fun and respite in the mountains of NC and we loved our visits with them so much. 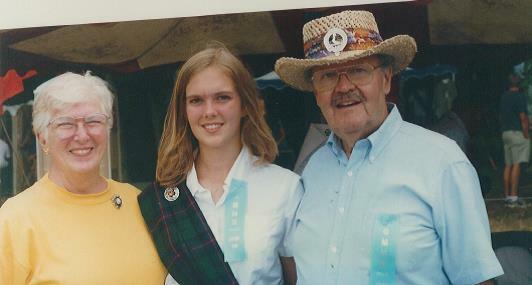 BJ, me, Granddaddy at the Highland Games on Grandfather Mountain (when I was in high school). I admired my grandparents and, now especially, I appreciate what they did for us. They helped fill in a hole in our lives. I learned my initial sewing, cooking, and canning lessons from them. I learned family history, appreciation of the land and what it can provide, conservative and liberal politics, and unconditional love. This blog was started to remember and explore the legacy they, and other family, left within me, and to honor who they are and were. What an amazing granddaughter you are Molly and I am so thankful that you have chosen to share such a wonderful family with the rest of us. While both my grandmothers have long since passed I do still have a almost 96 year old grandfather that I love to pieces. Recently I knit him a sweater that he now wears everyday, it makes me feel good that I could do just a little something for him after all he has done for me.